Whole roasted cauliflower with tahini sauce is great for serving as a main vegan dinner dish for celebration or every day. It is so tasty and delicious! Whole baked cauliflower is such an easy recipe, but full of flavor and taste. 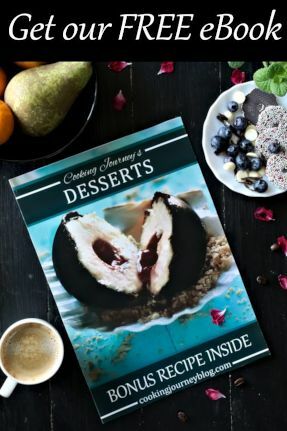 Sprinkled with pomegranate seeds makes it more festive and adds fresh taste. Whole roasted cauliflower recipe is vegan, gluten-free and dairy-free. 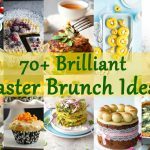 Also perfect for low-carb, paleo and keto diets! How to make this humble vegetable a show-stopper at your dinner? Follow step-by-step my method and this whole roasted cauliflower will be one of your favorite vegan dinner ideas! So let me explain how you can easily make entire head of cauliflower delicious. 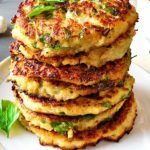 Moreover, this cauliflower recipe is much easier to make than roasted cauliflower steaks. 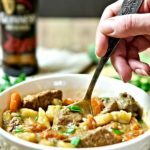 I love how easy this dinner recipe is! To prepare cauliflower, wash it and pat dry with paper towel, trim the outer leaves. That’s it. 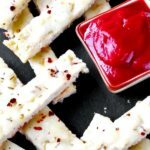 No food processor and almost no knife is needed to make this easy recipe. Maybe trim off the bottom of cauliflower, so it can sit on the baking dish. So all you need to do is steaming a head of cauliflower, which will make it easier to absorb the spices. If you don’t have a steamer, just put a head of cauliflower upside down in a big pot with boiling water and after 5-10 minutes (depending on the size of the vegetable) remove it from the pot with tongs. Preheat the oven. Let the cauliflower cool down just a little that you can touch it. Drizzle with olive oil and rub with spice mix. For spice rub I used dried ground garlic, cayenne pepper, smoked paprika, turmeric, cumin and lemon pepper. 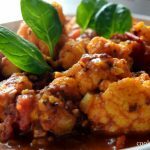 This spice mix will deliver beautiful taste and beautiful color of whole baked cauliflower, too. I rubbed with the hands, but you can use kitchen gloves, if you have any scratches on your hands. By the way, when you rub it, don’t forget to gently push cauliflower florets to get the flavor in between. Put cauliflower into the baking dish. You don’t need to wrap cauliflower head in aluminium foil. Bake in the preheated oven for half an hour until golden brown and florets are soften. You can check if the cauliflower is ready, inserting the tip of knife – it should come in with no resistance. Baking time depends in the size of cauliflower head, just wait until it’s brown on the outside. This cauliflower was quite big, but you can serve individual small cauliflowers, too. By the way, you can arrange baby potatoes (cut in half), baby carrots and garlic cloves in the pan around cauliflower. Bake them together with cauliflower, then leave vegetables in pan longer, if needed. Having some extra roasted vegetables on the hand is always good! Meanwhile cauliflower head is baking make tahini sauce, de-seed the pomegranate and chop parsley. 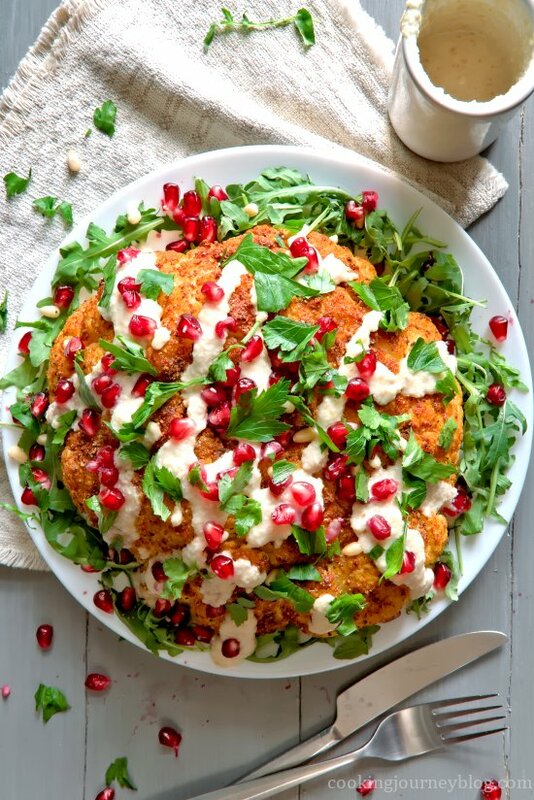 Serve whole roasted cauliflower, drizzled with tahini sauce, sprinkled with chopped parsley, pomegranate seeds and pine nuts. 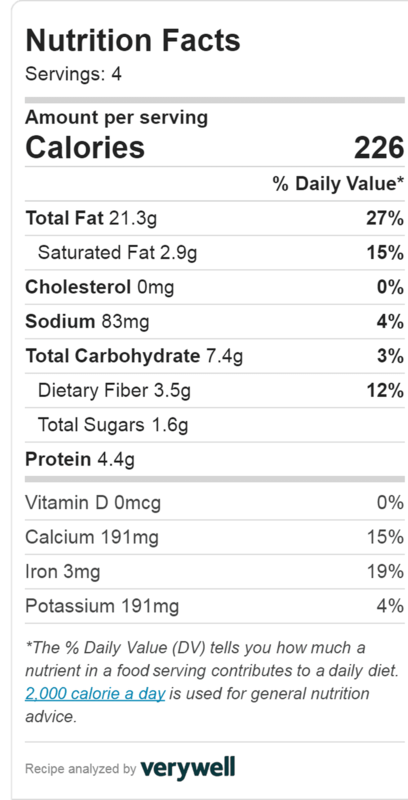 If you wish you can add sliced almonds instead. I also arranged rocket leaves around whole roasted cauliflower. To make tahini, just toast half a cup of sesame seeds on a pan (without oil) until golden brown. Let them cool, then put into food processor with lemon juice, olive oil and a splash of water. Blend until smooth or to your liking. I prefer it thick and chewy, but you can blend it further with more olive oil. Add salt and pepper, if needed. 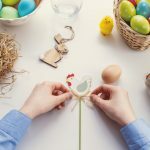 That is so easy and delicious! Add tahini to salads, toasts and so on. It lasts in the fridge up to 6 months. If you’re not a fan of tahini, you can use this vegan avocado pesto with whole baked cauliflower or any other cauliflower dish. 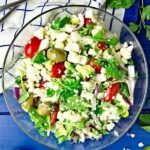 You can also use light soy sauce, whipped feta, yogurt, butter sauce for vegetarian topping. 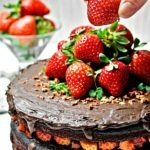 This vegan meal is so addictive and looks beautiful on the table! 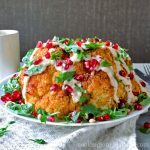 I highly recommend trying this whole baked cauliflower – spicy, comforting, perfectly rounded with tahini flavor and fresh pomegranate seeds. When you cut it (do the same like you cut your cake), this vegetable is moist and tender inside. Serve some extra tahini sauce on the side! This is one of our favorite cauliflower dishes so far. It look so festive, but at the same time – so easy to prepare and serve to your family and friends. Just give it a try! By the way, we enjoyed whole baked cauliflower cold from the lunch box from the fridge. Just irresistible and tasty in cold mode, too. You can also reheat it in the microwave for about 5 minutes on low or 10-15 minutes in the preheated oven (355 F / 180 C), with a little bit of water. Oven roasted veggies like cauliflower are easy to include in everyday cooking! 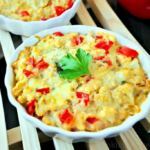 If you want to include more cauliflower in your diet, check also vegetarian cauliflower casserole, cauliflower soup or breakfast cauliflower fritters on our food blog. More cauliflower recipes are coming, as this is one of our favorite vegetables! 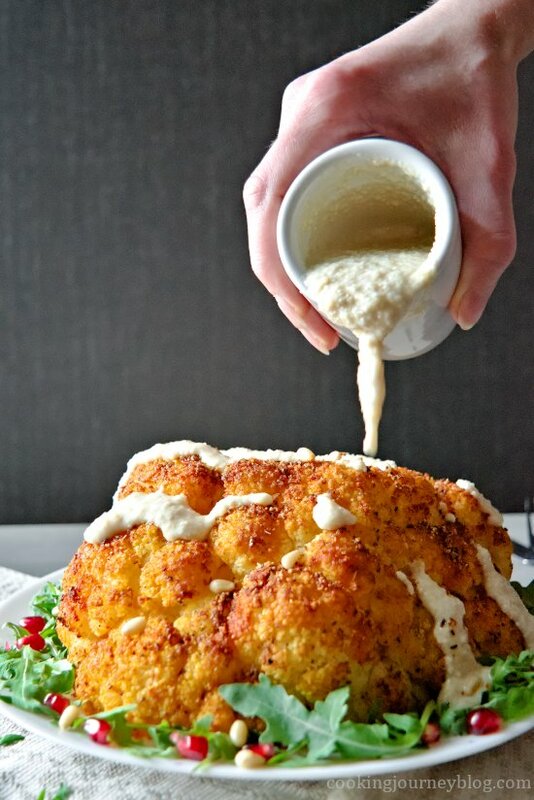 Whole roasted cauliflower with tahini sauce is great for serving as a main vegan dinner dish. 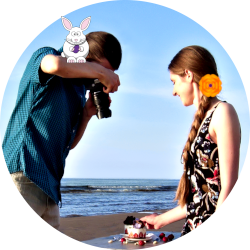 It is delicious, full of flavor and taste. Boil water in a big pot, put whole cauliflower with florets side down in a pot. Cook/steam on a medium heat for 10 minutes. Using tongs, transfer cauliflower to the baking dish with stem side down. Let it cool a little, meanwhile preheat oven to 390 F/ 200 C.
Drizzle cauliflower with olive oil, sprinkle with spice mix and rub with your hands, so that it all is covered. Bake cauliflower in oven for 20-30 minutes until soft and golden. Meanwhile, prepare tahini sauce. On a hot pan, medium heat, toast sesame seeds, stirring with wooden spatula, until golden, but not brown! Transfer to a wide plate and let cool. Then transfer seeds to food processor, add lemon juice, 1 tbsp olive oil and water. Process until smooth, adding more oil gradually. Add salt to taste. 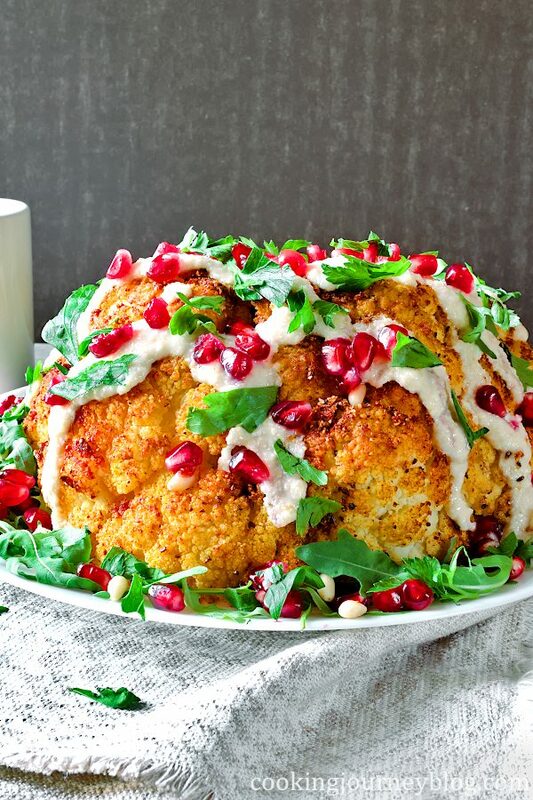 Serve hot cauliflower, drizzled with tahini sauce and sprinkled with pomegranate seeds, pine nuts and chopped parsley. 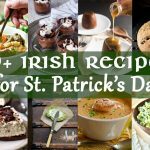 Great recipe for a vegan dish! I love roasting cauliflower and find it an easy way to get more veggies into your diet, cheers for sharing. Also love the touch of the pomegranates…..too pretty!! Yum! I love cauliflower in many forms, but never thought of roasting it whole like this. The sauce looks delicious as well. Tahini is great for tacos, salads and also like dipping sauce. Whole roasted cauliflower is actually pretty easy recipe to try! What a stunning creation! I love all the beautiful color and flavor in this cauliflower dish! Thanks so much! As I already mentioned, it is such an easy and beautiful main vegan dish to cook! Now that’s a centerpiece! 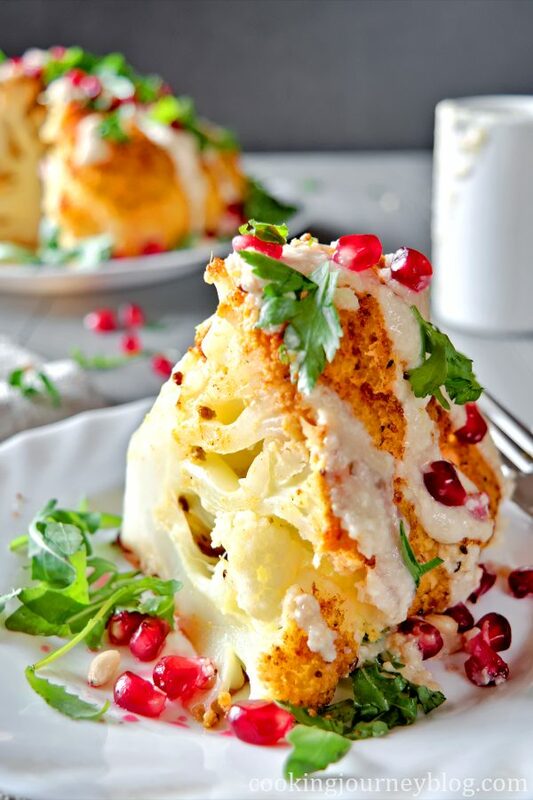 What a beautiful way to serve up cauliflower! Absolutely! We were very pleased how it turned out – moist, tender and flavorsome. Wow this is incredible. It looks like a feast in and of itself! 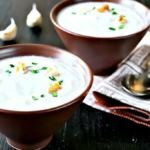 I love that tahini sauce and I’m always looking for new ways to serve cauliflower since it’s one of my daughter’s favorites! It’s one of our favorite veggies, too! 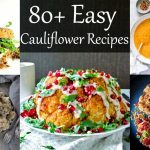 You need to check also our other cauliflower recipes. So much goodness here! Love the tahini sauce on top — and the pomegranate! I’d love this. So easy, but so good! Pomegranate adds freshness and festive notes. 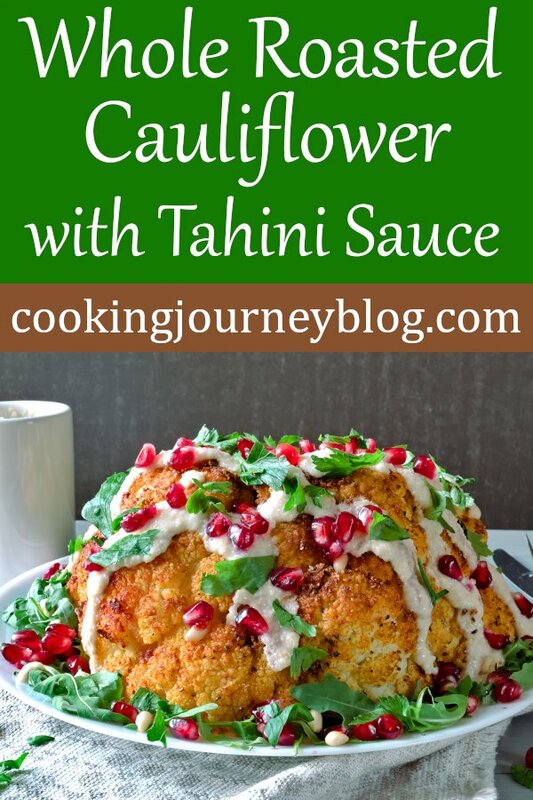 And I can’t imagine serving cauliflower without tahini from now on!